Off white lace with pink ribbon woven near center and ruffle below. 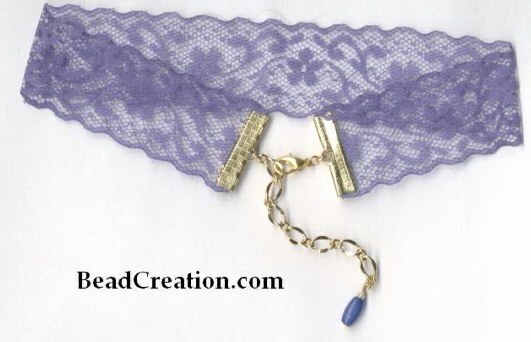 This exquisite purple lace choker is made from a soft and stretchy lace trim with a floral pattern and scalloped edges. 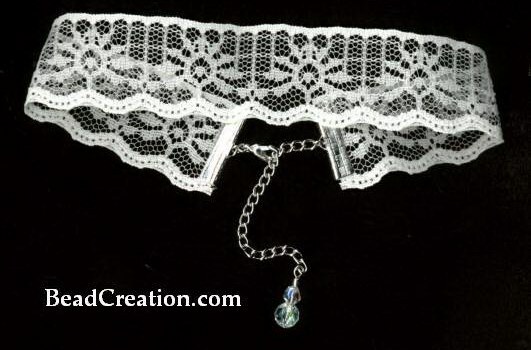 We feel the name of this choker is simple yet extremely descriptive of this stunning design. Don't you? Extra wide lace with scalloped bottom edge also available in blue. To view blue version click here. This hot little number has sequined roses at center of large scallopes. Slight imperfections in this lace and beading may occur. Reorganize Your Search at BeadCreation. Simply click on the direct link below to view the specific choker style.